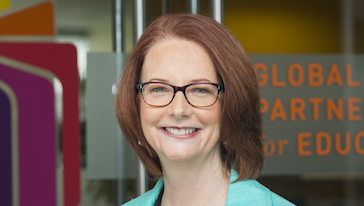 Julia Gillard was appointed as Chair of the Board of Directors of the Global Partnership for Educationin February 2014. She served as Prime Minister of Australia between 2010 and 2013 and delivered nation-changing policies including reforming Australia’s education at every level from early childhood to university education, improving the provision and sustainability of health care, aged care and dental care, commencing the nation’s first ever national scheme to care for people with disabilities. Before becoming Prime Minister, Ms. Gillard was Deputy Prime Minister and Minister for Education, Employment and Workplace Relations and Social Inclusion. "A big year beckons. My challenge to everyone: ensure that education is the center of post-2015 agenda"